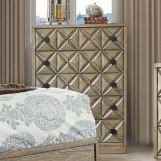 There's something about a tall headboard that just adds class to a bedroom. 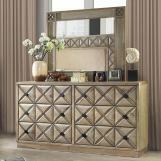 The combination of a foam padded fabric and carved x-shaped details plays with contrasting textures for a beautiful visual backdrop. 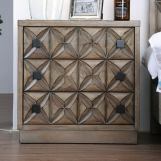 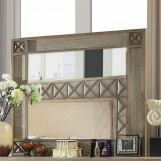 The matching case goods feature matching carved drawer faces with dark square hardware that stands out against the weathered light oak finish. 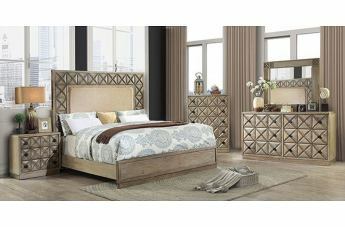 This bedroom set combines a touch of rustic wood with contemporary wood carving and fabric, allowing it to match any design direction you take.